James Spring and Wire designs and manufactures many different types of springs, including standard and custom springs for industrial and commercial applications for Original Equipment Manufacturers (OEM). 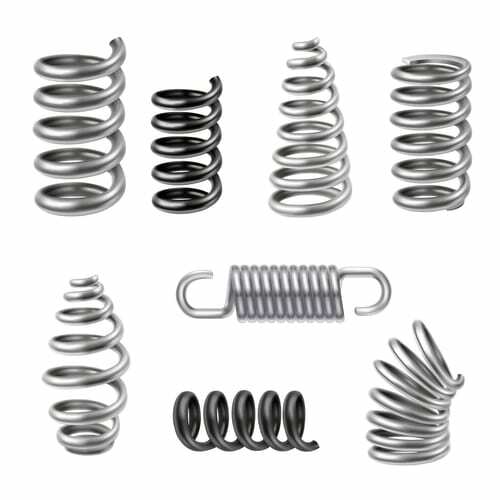 We offer a wide range of springs for use in many industries, examples include suspensions the automotive industry, in the utilities industry to produce springs for gas metering valves and water retention systems, springs for check valves and overhead cranes in heavy industry, springs used in durable household goods, in railway components like springs for brake calipers. The most common type of spring, the compression spring is designed to operate with a compression load, so the spring gets shorter as the load is applied to it. Think mattress springs, or a pogo stick, each are designed to become shorter when loaded. A compression spring’s coil does not touch in the unloaded position, and they need no attachment points. Here at James Spring we offer several configurations of compression springs, including hourglass (conical) springs, barrel (convex) springs, and conical compression springs. Because of their versatility, compression springs are used in a wide selection of applications, including industrial equipment, pens and notebooks, precision instruments and tools, drilling equipment, mining equipment, electronics, to name a few. The extension spring, also known as the tension spring, is designed to operate with a tension load, allowing the spring to resist stretching as the load is applied to it. Though extension springs are designed to become longer under load, their loops or coils are normally touching in the unloaded position, and they have a hook, eye or some other means of attachment at each end. Our extension springs come in a variety of different end configurations. This is to facilitate the attachment to the components being acted upon. End configurations that we offer include side hooks, center hooks, extended hooks, combination hooks, and custom shaped hooks. Because extension springs can both absorb and store energy, as well as create resistance to a pulling force, you’ll find them in carburetors, on lighter weight garage or commercial doors, trampolines, washing machines, farm machinery, and much more. Unlike compression springs and extension springs, in which the load is an axial force, the load applied to a torsion spring is a torque or rotary force, and the end of the spring rotates through an angle as the load is applied. As they wind up, torsion springs reduce in diameter and their body length becomes longer. It exerts a twist like that found on the hinge of a screen door, on a mousetrap, or a simple clothespin. Torsion-bar suspensions are used in many modern cars and trucks, as well as military vehicles. They are found in many vehicle suspension systems that use the torsion spring principle. Small, coiled torsion springs are often used to operate pop-up doors found on small consumer goods like digital cameras. James Spring manufactures single-bodied and double-bodied torsion springs with different end configurations including straight, offset, and hinge ends to meet the needs of OEMs.